A tale of natural disaster, bad judgment and heroism during World War II. In December 1944, a typhoon overtook a U.S. naval fleet that, under the leadership of Admiral William Halsey, was sailing in the Philippine Sea. The catastrophe was legendary—indeed, some believe it to be the basis for Herman Wouk’s Pulitzer Prize-winning novel, The Caine Mutiny. All told, three ships were destroyed, and almost 800 men died. Drawing on recently declassified documents, Drury (The Rescue Season, 2001, etc.) and Clavin (Dark Noon, not reviewed, etc.) recreate the terrifying days during which the crew battled the elements. But this is not just a tale of men against nature. It’s also a tale of men for, and against, other men: Lieutenant Commander Henry Lee Plage of the USS Tabberer flouted orders in a daring rescue effort. The most moving scenes come at the end of the book, as the survivors reckon with the fate of their many dead comrades. Sailors on the USS Knapp, having recovered a body so mutilated by sharks that it was unidentifiable, recited a service from the Book of Common Prayer, and committed the body back to the sea. Moments later, another body floated up from the depths—it was Lieutenant Lloyd Rust, and he, miraculously, was still alive. 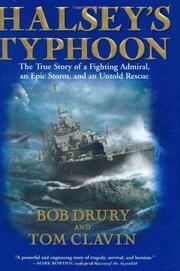 The authors’ prose is often vivid: The typhoon created not just waves, but “vertical sheet[s] of ocean,” slamming against the ships, and the sun that beat down on men struggling to stay afloat is “a red dahlia.” Drury and Clavin have managed to avoid the problems that so often plague books with two authors—jerky breaks in the narrative, chapters cast in radically different voices. Still, the book is marred by weak characterization—even the heroic Plage never becomes three-dimensional. The inherent drama of the events compensates for the sometimes lackluster storytelling.